Our God is a God of justice, but also a God of mercy. Through the blood of Jesus, God's mercy is available to us now. It is up to us to decide to accept it. 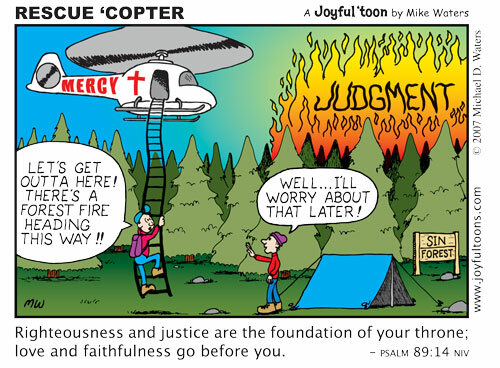 We don't want to be camping out in "Sin Forest" when judgment time comes. Sandee,Thanks I hope that you and Zane have a blessed Sunday as well. Excellent Mike is the best I can come up with also!! I haven't been in church now for weeks due to some major dental work and I really miss it!! Thanks for sharing this and blessings to you and yours for a peaceful and healthy week!